Feb, 2008. It would appear that the 12V "Aux" battery in the Rav is one of the weak points. 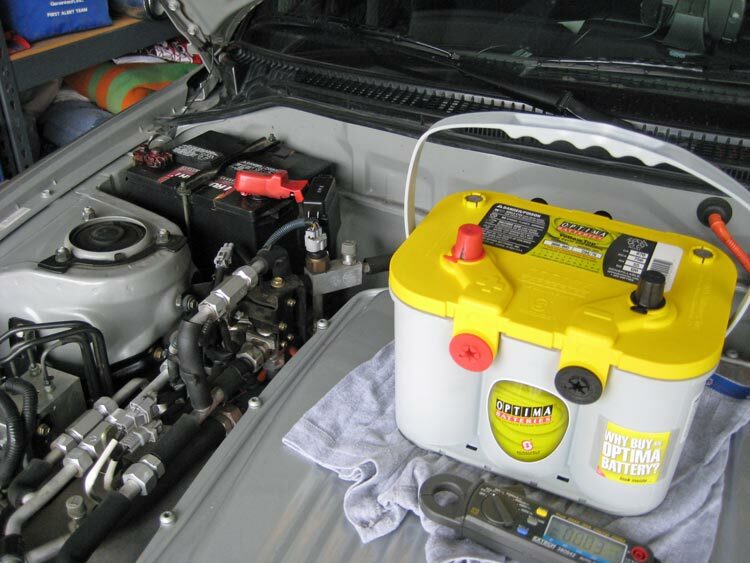 Somewhat ironic in a battery-powered car, that the standard "starter" battery is what gives headaches to so many owners. 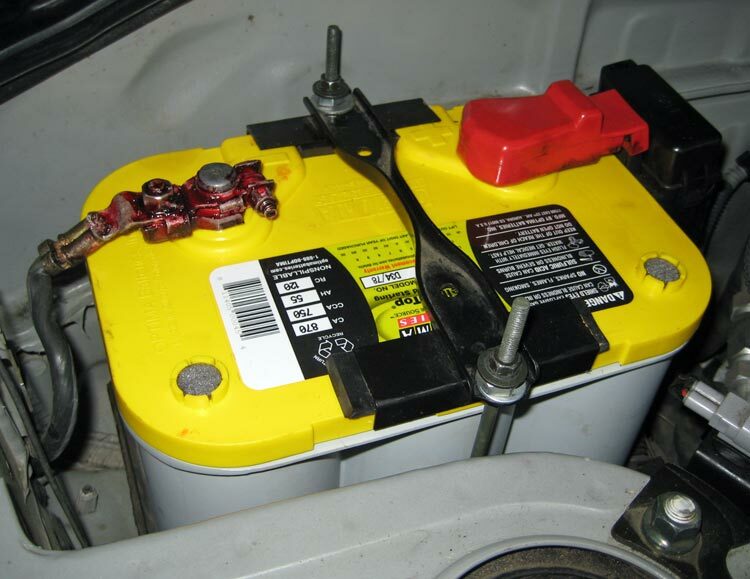 This battery is used to run all the normal 12V accessories (radio, lights, wipers, etc) as well as the various computers and the charger timer. There is never a huge draw on this battery (as in starting an ICE) but it appears that if the battery is not 100% healthy, that things start to go wonky in frustrating ways. I replaced my original Aux battery back in May 2005. It has been working great until recently when - in the bitter cold, and after sitting for a day or more - my charge timer became erratic. Sometimes - with no warning - the timer would simply fail to start the charge sequence. The Aux battery tests as being "OK" but I still don't trust it. 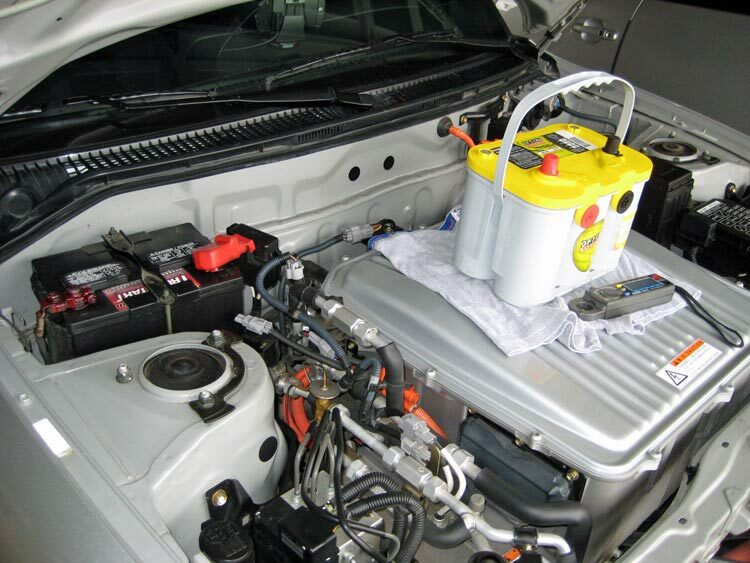 It was time for an Optima Yellow Top (made for deep discharge). The old battery will find new life as back up for my solar-charged LED house night-lighting system. There are three Optimas that I know will fit. A D35 (same size as is used in the gas Rav of the same year) a D34 and a D34/78. The D34 units offer more capacity, so I opted for that... and then found that the D34/78 was the same battery with additional side posts (for GM) that for some unknown reasons costs *less*. So I finally opted for the D34/78 from Amazon.. I paid $170 delivered. The prices fluxuate though! Original Aux: Panasonic 50D20L-MF Maintenance Free battery (replaced with Trustart 11-May- 2005) - not sure about the rated capacity. 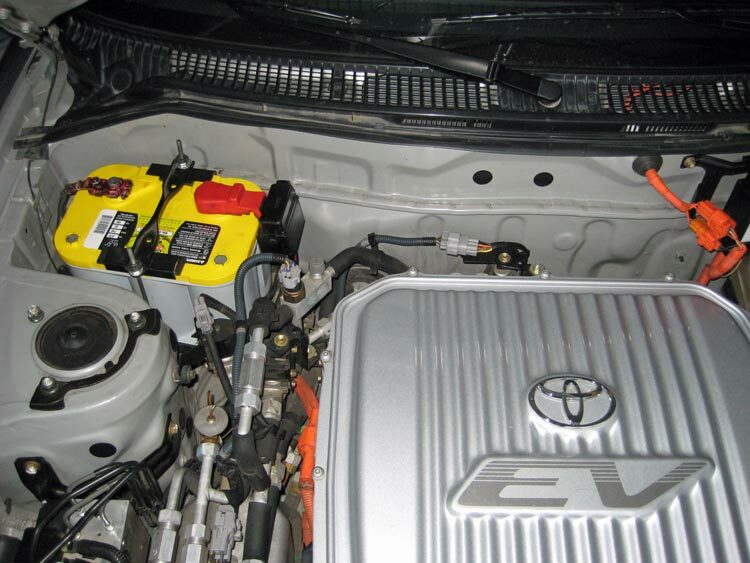 Official Toyota replacement Aux: Trustart Aux battery, Toyota PN 00544-35060-550 (replaced with Optima 02-Feb-2008). Note: having the Rav4INF interface plugged in (even with no Palm device at the other end of the cable) there is an additional 50 mA draw on the Aux). 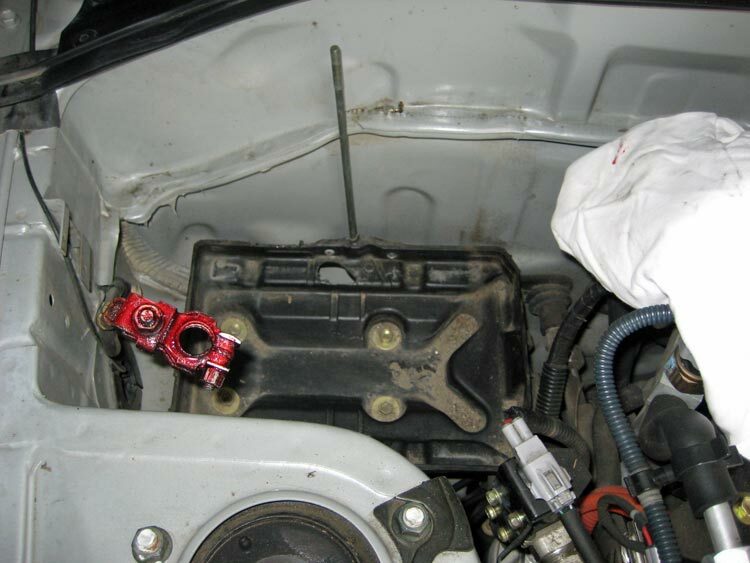 The battery clamps and the hold-down are removed with a 10mm spanner. The rear hold-down will stay in place (handy!) while the front one falls out of it's groove. Hang onto it when you remove the nut from the front one. I plugged a battery into a live outlet in the car to keep my radio stations, etc - that's why my positive terminal is wrapped up with the white rag out of harm's way. I left the crud in the bottom of the tray for the picture. No extra charge. Shiny new battery in place.. A few things to note in this picture: The battery is installed in a manner that appears backwards since the posts need to be oriented properly. 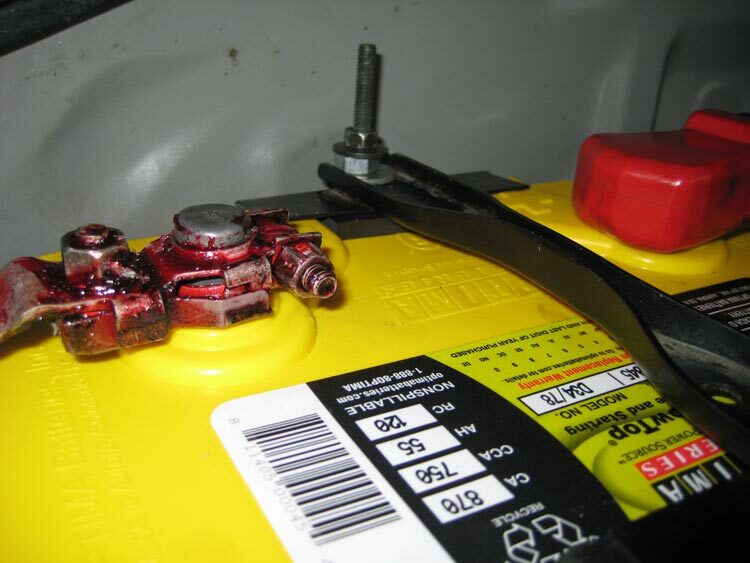 The negative cable (where it attaches to the clamp) had to be bent straighter to clear the passenger side of the battery. 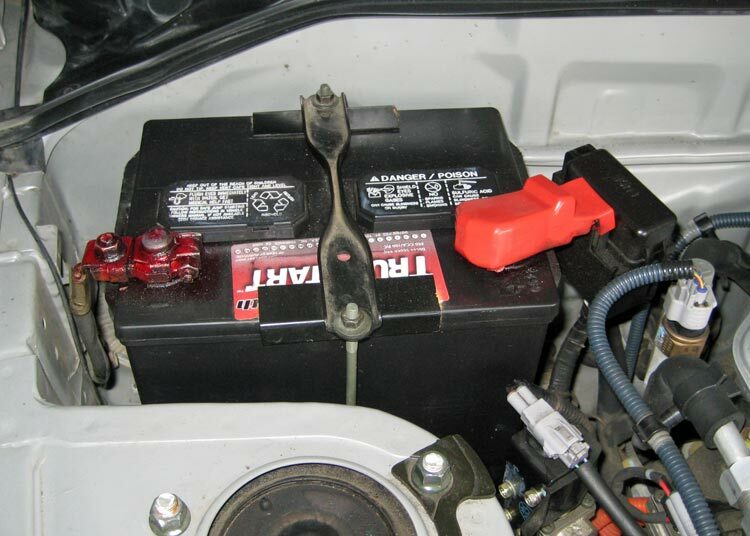 The posts are more inboard on this battery. The D35 wouldn't give you that problem. I added some spacers under the hold-down bolts, plus some rubber spacers under the clamps. Here you can see the rubber spacer I made for the rear since the clamp otherwise was bridging the plastic bulges for the terminals. You can see the specs sticker really well here too! The car works, so I'll call this a success for now. Here's hoping that the weirdness goes away. One interesting bit of data of unknown significance: After doing the swap, I measured the resting V of both batteries. Recall that the Optima had been shipped to me, and most definitely has not been charged in at *least* several days - likely quite a bit longer. The battery that I removed from my car was charged for several hours (via the paddle and inverter) just 30 minutes previous to the swap. So with the old battery sitting on the ground without any draw on it, I measured 12.72V. The new Optima - with the slight ~34 mA parasitic draw of the car - measured 12.85V. No, not a huge difference until you consider that the "old" one had recently been charged, and the new Optima has been sitting for a long time. I'm hopeful that this will solve my issues! ** One week update. Optima has worked perfectly every day now. And three hours after charging, it shows 13.1 V - a significant improvement over the 12.7 V measured on the old battery immediately after charging.